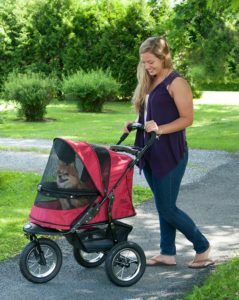 The Pet Gear No-Zip Jogger Pet Stroller is the perfect stroller if you love to combine an exercise session with an outing with your dog…or cat! The stroller I currently use is perfect for walking on pavement, and even rolling over tiny pebbles. However there are times we like to walk over rougher terrain, or I want to significantly quicken the pace, while ensuring my dog isn’t jostling around too much. While looking at jogger strollers, one in particular caught my eye – Pet Gear No-Zip Jogger Pet Stroller. I liked it so much that I decided to share my research findings with you. NO-ZIP is the most innovative feature in pet strollers today. Instead of zippers there is an easy locking latch, which makes it easier to open and close. No snagging, no fumbling and no chance of a zipper breaking, causing the stroller to potentially become un-usable. The wheels on a stroller are a key factor in the type of terrain you will be able to use your stroller on. If you want to jog with your pet, or walk through rough terrain, sand or grass, then Air Ride tires are recommended. A smoother ride means extra comfort for your pet, and makes pushing the stroller effortless. You can also lock the front wheel in place, which helps with stability. 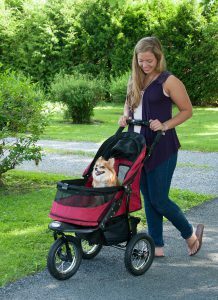 Pet Gear No-Zip Jogger Pet Stroller is an extremely versatile pet stroller. Not only do the air tires make it perfect for a nice stroll on a paved path, but you can easily use it for jogging or walking over rough terrain, and your dog will still enjoy a smooth ride. Zipperless entry means easy to open and close, no snagging on the fabric, or breaking, leaving your stroller unusable. The tray with cup holder puts drinks, treats, keys, phone etc… all close at hand. The spacious storage basket underneath has plenty of room for extras – snacks, sweater, sun hat, leash…. Easy to fold and easy to open, it’s no problem bringing it on the bus or train if needed. Takes up very little space in the back or trunk of the car, so you can all enjoy a family day out, and that includes the dog! I found 223 customer reviews at the time of writing, and they had awarded the Pet Gear No-Zip Jogger Pet Stroller 4.5 stars out of a possible 5 on average. 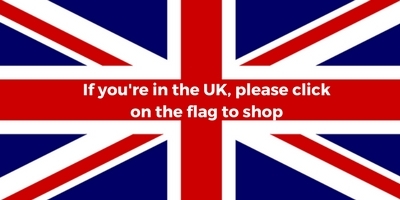 That makes it very easy for me to recommend the Pet Gear No-Zip Jogger Pet Stroller as well. In summary, the Pet Gear No-Zip Jogger Pet Stroller can handle a jog over rough terrain as easily as a gentle stroll on your local park’s paved walkways. 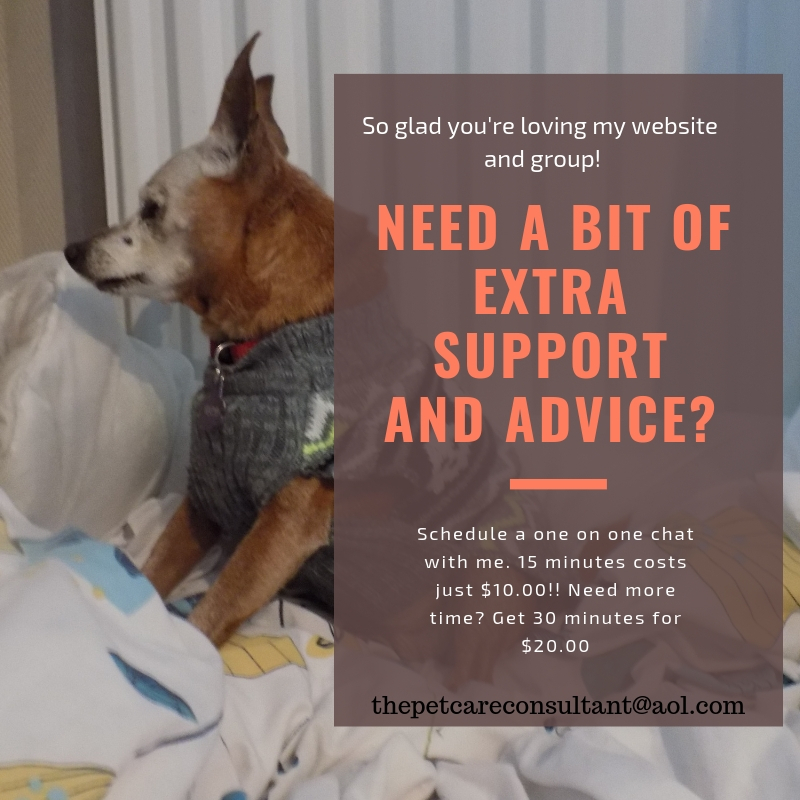 Whatever your situation (elderly dog, puppy tuckered out, pet recovering from illness or surgery…), he no longer needs to be left behind. Most real buyers of this product are extremely pleased with their purchase and would recommend this stroller to others.